Will the DDS80 still be around in 100 years time? Numark was at Summer NAMM 08 showing off its new CD player for DJs, the DDS80, along with the claim that the device is 'future proof'. 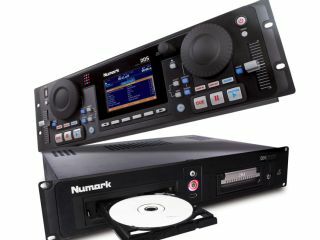 The term isn't one you'd probably associate with any technology these days - let alone with the words 'CD player' - but Numark is confident its new CD/hard drive hybrid player will stand the test of time. While MusicRadar thinks 'future-resistant' might be a more appropriate description, the DDS80 does have some pretty neat features. It's essentially a 3U controller with a 2U CD/media deck - including a hard drive that can be removed and swapped out if you need to upgrade your storage space or want multiple hard drives for different DJ sets. Media is also handled by the three USB ports that can connect to an iPod (you can play two songs at once just like on the iDJ2), flash drive or even more hard drives. Songs can be ripped from CD to the hard drive, and there's scratch support for CD MP3, WAV and unprotected AAC. In addition to the obligatory pitch shift/tempo controls and jog/scratch dials, the DDS80 has a large colour screen to make organising your song library easier, and Numark's 'Beatkeeper' technology for keeping loops and samples in check. All-in-all it sounds like a pretty handy device, although MusicRadar thinks that describing a DJ deck that can't hook up to a computer as 'future-proof' is a bit silly. Thanks to the in-built USB ports, though, perhaps such functionality is only an OS upgrade away. The Numark DDS80 will be available in Q3 2008, although prices haven't been announced. Full spec is available at Numark's official website.